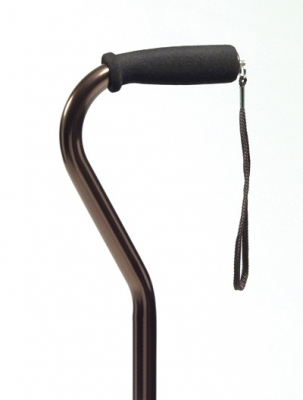 Offset handle places the user's weight directly over the base for maximum balance and control . Attractive finish resists marring and scratching . Easy push-button height adjustment with locking collet for added security . Available in a variety of finishes, grip styles and lengths . Includes laminated color operating instructions . 250 lb maximum weight capacity . Designed to meet the requirements of HCPCS code: E0100 . Limited lifetime warranty . Soft, warm and contoured for maximum comfort . Sculpted grip reduces the chance of slippage, even when wet . Comes complete with convenient wrist strap .